If you are training supervisors in a two-hour, DOT Drug and Alcohol Training Course, will they walk out the door as unprepared to confront workplace substance abuse as when they walked in? They will unless effective take-away handouts and tip sheets are included in your training. This is why we don't take chances and distribute EIGHT INTENSIVE HANDOUTS that rock. Let's talk about them. Then see if you can find more powerful tip sheets like them anywhere. Your training program can't be a simple educational experience with just signs and symptoms and drugs of abuse required by the DOT regulations. No way. Sure, you will meet the "technical requirements" but you will leave your organization at risk. You must to go further so supervisors walk out the door really "getting it." The DOT terminology is hung up on semantics. For example, they are using terms like "alcohol misuse" in the workplace rather than another term that could be far more useful and descriptive. Most addiction experts have never heard this phrase used in any practical way until the DOT came up with it. The US DOT offers only a few sentences that describe the educational mandate for workplace substance abuse education, but the employer will remain at risk if you do not address many other issues associated with substance abuse. So, go beyond the mandate. It's easy to do. There is much more that needs to be uncovered. One of these topics worthy of discussion is the myths and misconceptions about substance abuse. So let's talk about how you can beef up your training, make it interesting, and do some real good with DOT wellness tip sheets and handouts associated with substance abuse education of supervisors. Here are nine tip sheets described below that should be embedded in an online reasonable suspicion training program for supervisors, or distributed during a live presentation with video, PowerPoint, DVD, or a chalkboard. Thinking About Your Drinking - This workplace wellness tip sheet focuses on self-diagnosis of one's own use of alcohol. I know, its not about employees to be supervised by the designated employer's representative exactly, but let's face it--if a supervisor is an alcoholic, there is going to be resistance, or at the very leas cognitive dissonance. So, this handout dispels myths, misconceptions, and by the end of the read, has most supervisors saying, "I'm okay"....or "Whoops..I think I have a drinking problem." How many supervisors do you think are also alcoholic? Better question--how many alcoholic supervisors will avoid confronting employees who are drinking on the job? Obviously, this tip sheet is a "no brain-er." Functional Alcoholism - This tip sheet targets the ultimate enabling statement -- referring to someone as a functioning alcoholic. You'll rarely hear family members use this term because they live with the alcoholic, and those who live with alcoholics do not use this term. It makes all the difference in the world if you live with an alcoholic. And anyone who lives with an alcoholic will not call them "functional" because they see the behaviors of the addict up close. Hence, this term is more often used by acquaintances, fellow workers, and subordinates. The simple translation is "the alcoholic's behavior doesn't bother me." Can you see how enabling this phrase can be and how absurd it is to actually use it? Educating supervisors not to use this term will also help them see the disease of addiction more readily. This tip sheet topic usually generates a lot of discussion in DOT reasonable suspicion training classes. Also, notice how denial goes hand in hand with this phrase. Also, consider how this DOT supervisor training tip sheet can find its way home to make an impact on family members. This is how you get employees engaged. Excuses Employees Give When Confronted - This is really not a tip sheet but a section of the program that could be a tip sheet, and one that I want to discuss with you. "I haven't have a drink since last night." You can preview this program here: Ten Excuses for DOT drug and alcohol training here separately if needed. Performance Signs and Symptoms Checklist - I distribute a behavioral signs and symptoms checklist because most DOT supervisor training observation is still about performance issues not looking for drunk or intoxicated people. Supervisors typically refer employees to an EAP for documented performance issues. And, this may lead to the treatment of an employee with addictive disease. Alcoholic and drug addicted employees may be referred for many types of performance issues -- absenteeism for example, so DOT Supervisor training in drug and alcohol awareness must include simple behavioral-performance education, documentation, and confrontation techniques. Some of these may have nothing obviously associated with substance abuse. Did you know that looking for alcoholics and drug users never really worked? The USA has a 70 year history of formal occupational alcoholism education, awareness, and intervention education with managers and supervisors. However this direct observation technique was proven to be pure folly back in the 1950's and1960's when Lewis Presnall created the major paradigm shift of focusing on performance instead of alcoholism. The entire EAP movement sprung from this discovery. Unfortunately, the DOT returned to this model without placing major emphasis on performance-based intervention. Drugs of Abuse Chart (Names, Street Names, Effects, Impact, Signs of Use, Risk of Use) - this is a chart of drugs and their street names that needs to be covered in the DOT Drug and Alcohol Training material. Update this periodically so it includes common illicit and legal substances that are emerging in society. Do you know what spice, bath salts, and Salvia are? These things are sold on the Internet and easily obtained. The DOT does not say anything about them, but do you really want to keep supervisors in the dark about these things? No. Prescription medication, especially Opioids should get a special mention as well. They of course are covered by the DOT regulations for required education and training of supervisors. Illness Progression and Recovery Curve in Addictive Disease - I like supervisors to see progression curves of addictive disease so they can see the reality of how these illnesses progress. As addiction gets worse, there are direct signs and symptoms, and they should know what they are because they mix with performance issues and can be confusing. An employee who is absent from work and blames those problems on a teenager acting out may also have an alcoholism problem. Helping supervisors not get caught up in the personal problems of employees and distracted by these "symptoms" can prevent them from postponing referral to the EAP, or in some cases testing. Performance Deterioration Curve in Drug and Alcohol Addiction - This is the curve that shows performance and attendance deterioration over time. It can be a helpful reality check for a supervisor to act now before things get worse and some catastrophe ensues. Enabling in the Workplace - This tip sheet discusses enabling, but not just enabling by the supervisor. It also organizational, coworker, environmental, and community associated contributing factors to enabling and the progression of the illness that they facilitate. who socialize around alcohol more not because of the profession itself, but because of the opportunity to tax one's susceptibility to the illness if the vulnerability exists.The profession doesn't cause alcoholism--like stress if are a salesman. Instead it is the opportunity and frequency of taxing one's susceptibility to the the illness of addiction that allow it evolve faster. You can purchase this at the link above for your next DOT Supervisor Training class. 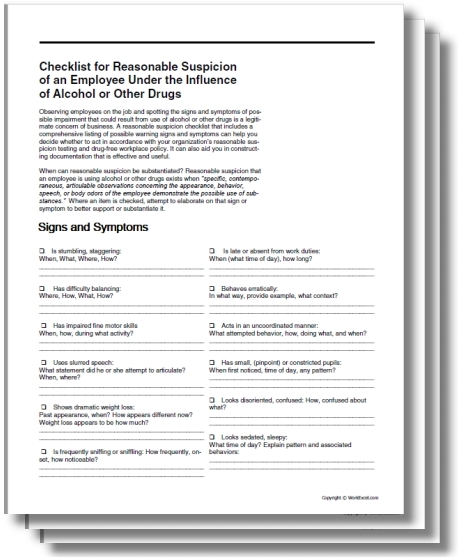 This handout however is free with the DOT (or non-DOT reasonable suspicion training program) is the most complete checklist you will ever see.